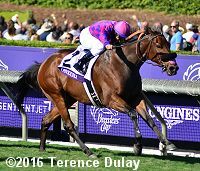 A full field of 14 older horses contested the $1 million Breeders' Cup Turf Sprint (G1) going about 6 1/2 furlongs down the unique Hillside course at Santa Anita. 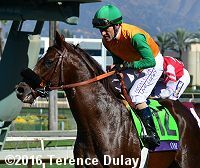 Poker (G3) winner Obviously was sent off as the 7-2 favorite in the full field of 14 off his third place finish in the City of Hope Mile (G2). 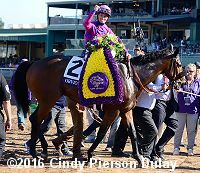 In to challenge him included 6-1 second choice Washington DC, second in the Prix de l'Abbaye (G1) last out, and 13-2 third choice Om, second in both the Del Mar Mile (G2) and City of Hope Mile. 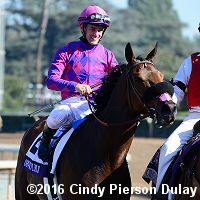 Jockey Flavien Prat sent Obviously to a clear lead down the hillside chute through fractions of 21.41 and 43.08, pressed by 12-1 Pure Sensation and stalked by 27-1 Mongolian Saturday. Crossing into the infield, he continued to lead by 1 1/2 lengths through 3/4 in 1:05.21. Om, last early under Gary Stevens, unleashed a strong rally despite Stevens losing his whip at the 1/16, but Obviously held on to win by a nose in 1:11.33. It was a length back to Pure Sensation third. Left: Obviously heads to the winner's circle. 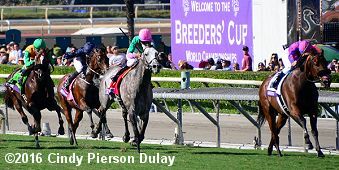 Winning jockey Flavien Prat said, "We had a great race. As always, he didn't break super fast. After a few steps, that's why he showed the speed. I was pretty surprised to be on the lead that easy. And once he got the lead, he relaxed well. And right before crossing, I asked him to pick it up. And after that, I was gone." Right: The trophy celebration. 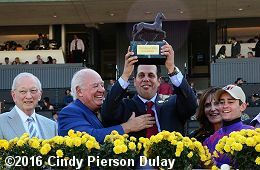 Trainer Phil D'Amato (holding the trophy) said, "We tried the Mile a bunch of times and kind of always got caught around the 1/16 pole. He had run in the past down the hill with some success, and we just thought, if we put him on the lead here, he had enough bottom in him that if they beat him, they beat him on the square. It wasn't that he was going to get tired, and it worked out." Left: Obviously heads over the the turf course before the race. Right: Obviously heads back to the barn. Co-owner Anthony Fanticola said, "Well, it's one for the old guys, I can tell you he doesn't know he's eight. But I tell you, we have a tremendous team, and Phil D'Amato, his whole staff, I got the best partner in the world. Boomer's Bloodstock, who picked this out, Boomer and McCall are just dynamite folks. They really know their horse people. Flavien gave the ride of a lifetime. He's a heck of an athlete and probably one of the best riders probably in the world." Left: Second place finisher Om returns after the race. 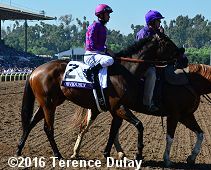 Trainer Dan Hendricks said, "He missed the break slightly and had to make up a lot of ground on a really good horse. We can't be prouder." Jockey Gary Stevens added, "He got wiped out leaving the gate, which he did to himself, and it was a tough beat. He broke completely sideways from the gate and he had to overcome a lot. Almost got it done." 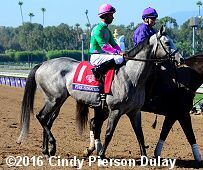 Right: Third place finisher Pure Sensation heads over to the turf course before the race. 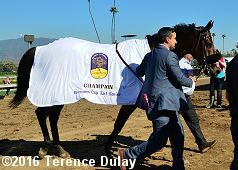 Trainer Christophe Clement said, "I'm happy with our race except for the final result.� He got a perfect ride and ran his race.� We were unfortunately third best today."